In 1855 Henrietta Augusta Nevill married Thomas Edward Mostyn Lloyd-Mostyn (1830-1851), the heir apparent of the 2nd Baron Mostyn. In May 1861 she was widowed following the devastating death of her husband from consumption, being left to bring up her two young sons and dedicating her life to preserve the rightful inheritance of her eldest, Llewellyn Nevill Vaughan Lloyd-Mostyn (1856-1929), who would eventually become the 3rd Baron Mostyn on the death of his grandfather in 1884. Nevertheless, his successful inheritance depended on finding a solution to the severe mortgage indebtedness of the family. Despite the continuing development of Llandudno, the scale and complexity of their debts (calculated at £720,000) was becoming a serious problem. 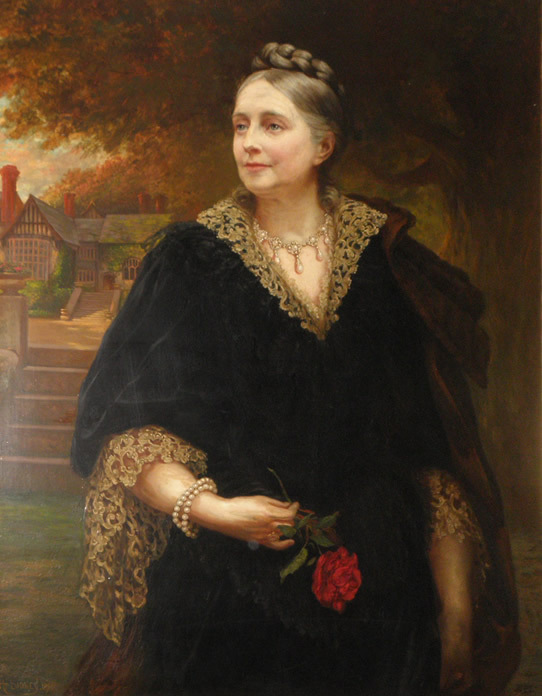 Much of the family’s lands needed to be sold in order to reduce the deficit but Lady Augusta argued forcefully that the sale of Llandudno would be detrimental to the interests of her son, considering it to be ‘the mainstay of the family’. She played a pivotal role in returning the family to a state of financial stability. In 1879 she returned to live at the newly refurbished Gloddaith hall, remaining there until her death in 1912. During her lifetime her contribution to the development of Llandudno and district was immense. She funded the building of Ysgol Bodafon in 1872, financed the construction of Marine Drive in 1877 and in 1898 she built All Saints Church (Deganwy) in honour of her parents, also contributing towards the building of St. Paul’s Church (Craig-y-Don). She oversaw the foundation of the Oriel Mostyn Art Gallery (opened 1902), stipulating that it should prominently display the works of female artists.